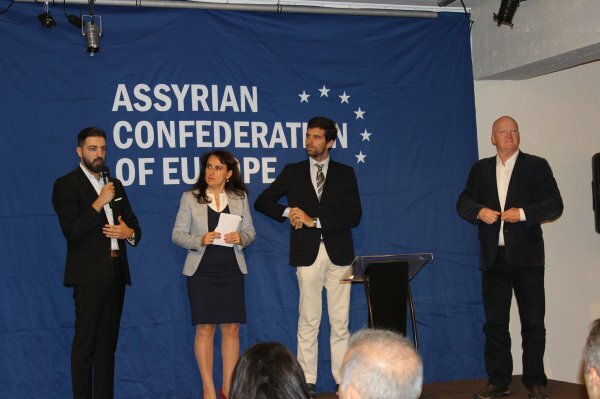 The Assyrian Confederation of Europe, the main body representing the half a million Assyrians living in the EU has concluded its second convention. More than 120 delegates from nine different countries participated in the convention held 7-8 October in Brussels, the European capital which is the seat of the European parliament and other EU institution. Among the speakers at the event was the vice ambassador of Iraq to the European Union, Mr Yasir Almahdawi, the programme director of the Unrepresented Nations and Peoples Organisation, Mr Tommaso Nodari and the Brussels coordinator of the European Armenian Federation for Justice and Democracy, Ms. Lianna Margaryan. The president of the Assyrian Confederation, Ms. Attiya Gamri delivered the keynote speech in which she focused on the need for the Assyrian European community to continue and expand joint efforts and thanked the delegates for their commitment to building a better future for Assyrians in Europe and Assyria. Additionally, Mr Tommaso Nodari speech offered the UNPO perspective on the issues facing Assyrians. UNPO directed attention to the Assyrian Diaspora and its role in addressing the crisis facing the Assyrian communities in Iraq and imporving the national international credibility. The Assyrian Confederation of Europe was established in 2016 and has expanded since then to include the Assyrian national federations of Sweden, Germany, Netherlands and Belgium.